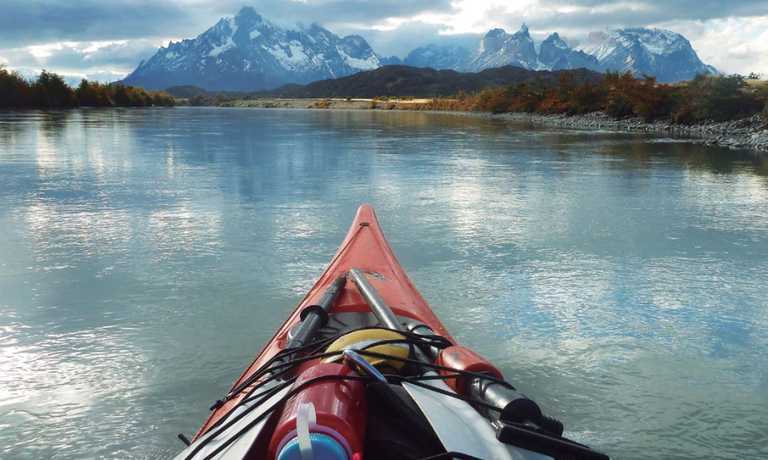 This 5-day kayaking trip takes you to the lakes, glaciers and rivers of the Torres del Paine National Park, you'll experience calmer and stormier kayaking and camp in the wilderness. Day 1: In a private transfer we will pick you up. This can be from inside the Torres del Paine National Park (Hosteria las Torres, Pudeto, Hosteria Grey), from your hotel/hostal in Puerto Natales or directly from our operation base. 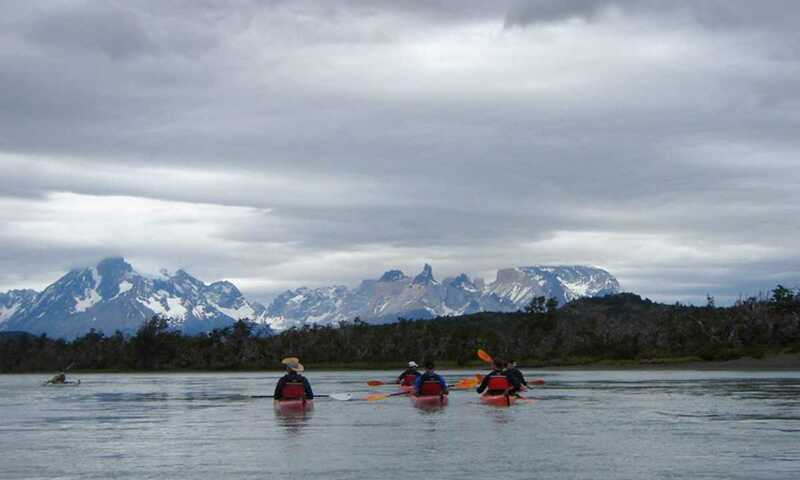 We will begin at the río Serrrano sector (located at the southern border of Torres del Paine National Park) where we will prepare & distribute the kayaks so that we can then begin with the safety & paddling instructions. 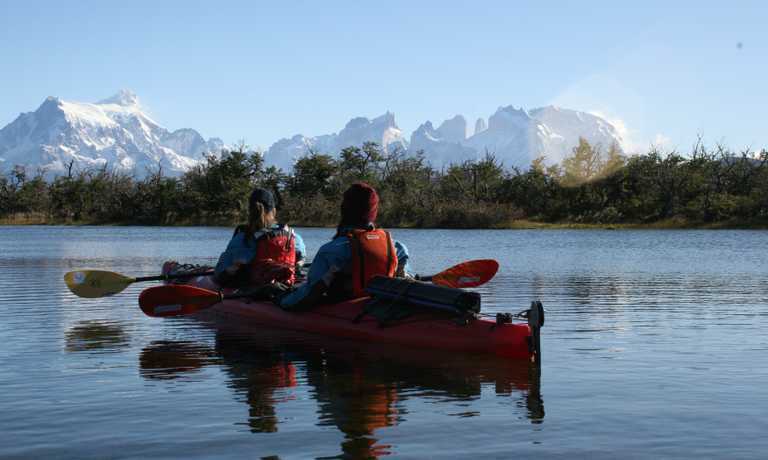 Our guides will help to recommend the appropriate equipment you´ll need to take during the the trip, so that the rest of your lugguage will be taken directly to Puerto Natales by a private transfer (to store in the Antares kayak office). This day we will paddle approximately 2 hrs across the 1st section of río Serrano, this is a calm zone that is good for us to see the level & comfort of the kayakers paddling. After, we´ll arrive at a small waterfall in the river where we will have our 1st teamwork experience in carrying the kayaks 100m approx. Depending on the weather conditions and the hours of light left in the day, we will continue for 1 or 2 hrs more to arrive at the camp for the 1st night. Day 2: We will begin with a good breakfast (fruit, cereal, wholemeal bread, milk, ground coffee and a speciality of the guide). We will start to paddle once we´ve packed away the camp. In this section of the river there are National Park lands & privately owned lands and in these we will see the typical cold forrest vegetation of Magallanes & the associated fauna. 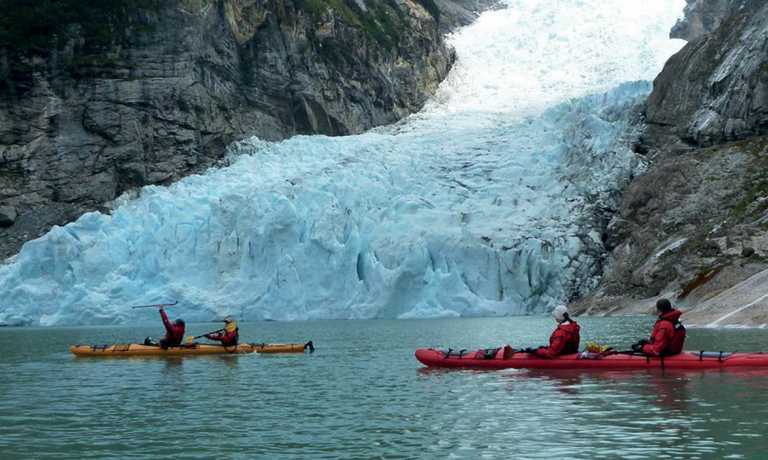 We will also be able to observe from a distance, the glaciers of the Southern Patagonian ice field, we will continue padlling to finally arrive at Puerto Toro (Bernardo O´higgins National Park), our camp base here is near the Serrano glacier. For the sunset, there´s the possibility to walk 30mins to the lookout of the Serrano glacier, in which time our guide will be finalizing the camp and will prepare dinner. 2nd night camping. Day 3: Early in the morning; we´ll revise the climate conditions in the gulf and if its permitting we will paddle 4 hrs approx. to reach our next camp in the Amid Canal, from where we´ll visit in kayaks or by foot (depending on the level of the tide) to the Azul lake, an impressive scene where the mountains mark the entrance to the Southern Patagonian ice field. At the camp we will enjoy the peace brought to us by the distance of civilization. 3rd night camping. Day 4: After another warm breakfast, we´ll pack up the camp to start our return to Puerto Toro. The estimated time will depend on the wind and tide conditions. We will use the day to develop this activity. On arrival we´ll prepare our camp once again and enjoy our last night together. 4th night camping. Day 5: With an early start; depending on the weather conditions, we will carry the kayaks 100m to the lagoon of the Serrano glacier so that we can paddle in & amongst the ice-bergs to enjoy its intensity in colour & essence until 11:00am, or if you want you can just rest & wait for the arrival of the boat that will take us back to Puerto Natales (we won´t forget that this is your holiday) We will pack away the camp before boarding the boat, which departs at 13:00 (either the 21 de Mayo or DÁgostini). We´ll stop off at the tourist complex "Estancia Perales" to enjoy a farewell BBQ of our experience. Arrival at Puerto Natales 17:00 hrs. Transfer to our office.